Adam Gilchrist produced a scintillating 83 off 50 balls before a batting collapse by Australia gave Sri Lanka a consolation 13-run victory in their triangular series one-day international on Friday. Gilchrist smashed 11 boundaries and two sixes in his final innings. 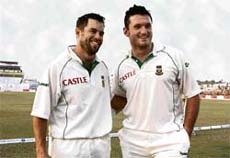 Captain Graeme Smith hit an unbeaten double century on Friday as he and Neil McKenzie shared a record 405-run opening stand on the first day of the second test against Bangladesh. Cricket Australia (CA) officials have been labelled "sooks" (an Australian slang for a weak, timid person) as two of country's sporting greats described the warning given to Matthew Hayden as "over the top", the media reported. India must wait until tomorrow morning to find out who it will face in the ICC U-19 Cricket World Cup 2008 final as rain played spoilsport, interrupting a finely poised semifinal between South Africa and Pakistan here today. A scorching 65 by 'feverish' Shiv Kapur catapulted him to the joint lead along with Australia's Unho Park who fired 6 under par 66 after the second round of the Johnnie Walker Classic golf here today as compatriots Jyoti Randhawa and Japan's Taichiro Kiyota stayed within striking reach. A nervous India will launch their campaign in the world hockey Olympic qualifying tournament with a match against Russia here tomorrow, fully aware that any slip-up at this stage could shatter their hopes of an Olympic berth. The ability to sustain the pace and fitness levels will hold the key for India's quest for a berth in the Beijing Olympics, according to former hockey captain M M Somaya who describes the qualifying tournament as "the most important" assignment for the team in recent years. India bounced back from the defeat against Turkey as they blanked Nigeria 3-0 in the play-off tie for the 33-36 positions in the World Table Tennis Championship here today. World Champion Viswanathan Anand scored a clinical victory over Alexei Shirov of Spain in the eighth round of the Morelia-Linares International chess tournament underway here. Adam Gilchrist produced a scintillating 83 off 50 balls before a batting collapse by Australia gave Sri Lanka a consolation 13-run victory in their triangular series one-day international on Friday. Gilchrist smashed 11 boundaries and two sixes in his final innings at the Melbourne Cricket Ground until the collapse derailed his team's pursuit of Sri Lanka's 221 all out. Australia lost five wickets for eight runs to slump to 115 for five and were eventually bowled out for 208, despite 37 from Brett Lee that pushed them to within sight of victory. Ishara Amerasinghe led the Sri Lankan bowlers with three for 44. Australia had already qualified for the best of three finals starting on Sunday against India and apart from Gilchrist, Brad Hogg and Sri Lanka's Sanath Jayasuriya and Muttiah Muralitharan, all of whom were playing their last matches at the ground, there was little riding on the match for either side. Gilchrist, Hogg and Jayasuriya have announced their retirements from international cricket, while Muralitharan has said he is on his last tour of Australia. Gilchrist appeared determined to go out in style, and was within sight of Matthew Hayden's Australian record of the fastest one-day century (66 balls) when a superb diving catch by Lasith Malinga deep in the outfield ended his innings. Both openers capitalised on a flat batting pitch to go on a run spree and frustrate Bangladesh's luckless bowlers. Smith belted 32 fours and a six to remain unbeaten on 223 at the close. McKenzie's more patient innings of 169 not out included 20 boundaries and three massive sixes. The duo piled on the runs with ease to build up a record opening partnership for the side against any team, eclipsing the previous benchmark of 358 against Pakistan in Cape Town in 2003. It was also the highest opening partnership against Bangladesh by any team. On a day when records tumbled, Smith enjoyed a personal landmark when he became the latest South African to join the 5,000-run club. He followed in the footsteps of Jacques Kallis, Gary Kirsten and Herschelle Gibbs. He brought up his 14th test century be steering a single past point. Almost 40 overs later, Smith continued to torture the home side and whipped a Mashrafe Mortaza delivery through midwicket to the boundary to bring up his fourth double century, and second against Bangladesh. His feat allowed him to become the first South African to amass four double hundreds, surpassing the record he had shared with Kirsten. Friday's run spree put South Africa in a position to complete a series whitewash after they notched up a five-wicket win in the first Test. CA has been under fire after Hayden was reprimanded for his description of Harbhajan Singh as an "obnoxious little weed". Jeff Thomson expressed his displeasure over Hayden's official reprimand while legendary rugby league hardman Tommy Raudonikis called country's cricket administrators "sooks". "Every time someone says something, some official pulls him in," Thomson was quoted as saying in The Daily Telegraph. The rain, which has had little impact on the tournament so far, fell with great force tonight just as the match was turning into a potential classic. Since the minimum of 20 overs were not completed, the match will resume tomorrow. South Africa, who were put in to bat, piled up 260-8 off their alotted 50 overs thanks to half-centuries from J Smuts (58), Rilee Rossouw (53) and Jonathan Vandiar (50) while Imad Wasim was the most successful among the Pakistan bowlers with figures of 3/44. Smuts and Pieter Malan got the junior Proteas off to a solid start, putting on 35 before Malan was caught behind off the bowling of Adil Raza for 15. But the Pakistan bowlers fought hard and no one more so than captain Imad Wasim. The left-arm slow bowler was ably supported by Ahmad Shahzad (2-35 off eight overs). Pakistan, however, began their chase in a shaky manner, losing opener Umar Akmal and number three Shaan Khan with just 15 runs on the board. With the score at 61-2, the heavens opened up and three overs were deducted from the Pakistan innings before it was possible to retake the field with the target adjusted accordingly to 252. The 26-year old Delhi-based Kapur and Park lead has a lead of one stroke over Jyoti Randhawa, who also came up with a blistering 65 and Japan's Taichiro Kiyota, who carded a 67. The cut was applied at 2 under 142 and 66 golfers, including 11 Indians, made the cut while seven others, including SSP Chowrasia and first round leader Shamim Khan, fell by the way side. Two Indians who were tied at third place yesterday-Jeev Milkha Singh and Rahil Ganjee saw their fortunes plummeting as they slipped to tied ninth and 16th positions, respectively. Shiv, who had three under par 69 yesterday, fired five birdies and a eagle on the 6th to have two round aggregate of 10 under 134. Randhawa, who yesterday had a 2 under par 70 round and was tied at 24th place, needed a flawless round to stay in contention and he achieved it this morning. The crowd favourite had four birdies - 3rd, 5th, 6th and 7th- on his front nine and coming back he carded three more-11th,15th,17th - to end the day at 65 and with a total of 9 under 135 climbed up to joint second spot with Japan's Taichiro Kiyota, who carded a 67 in this round. Playing on his home course, Asia's number one in 2002, Randhawa said a change in mindset helped him produce a seven-birdie round. ''It's a great round. I think after playing yesterday's round, I'm really happy to be where I am today. I was not feeling all that great when I finished yesterday, and I think I decided what to do today and I stuck with it,'' Randhawa said. Jeev fired five birdies - at 7th, 8th, 13th, 14th and 16th but a double bogey on the 9th and then another bogey on the 17th spoiled his round and he ended the day with two under 70. The Chandigarh based pro who had shot 68 in the first round, with a two round total of 6 under 138 slipped to joint ninth place. Rahil Ganjee, overnight 68, fired four superb birdies on the 4th, 6th, 7th and 8th but dropped two strokes on the 9th and then hit another bogey on 14th to have a one under par 71 and with an aggregate of 5 under 139 he came down to joint 17th position. Since only the winner of the tough six-nation tournament would book a place in the Beijing Olympics, chief coach Joaquim Carvalho wants to take one match at a time and not leave any thing to chance. The Indians are keen to win their opening match against Russia with a big margin to avoid the pitfall of goal difference in the later stages of the tournament. "It would be the same for the other games. That way, we will avoid the pitfalls of goal-difference or depending on results of other matches," he said at the sprawling Prince of Wales club here. Carvalho, however, admitted that the task on hand was indeed difficult and the pressure factor could play a decisive role in the fortunes of all the teams. "It is not just India who will be under pressure, but all the other teams too. We have done everything possible to get the players in top condition and I am confident that we will deliver some strong results," he said. Looking ahead to the game against Russia who, incidentally lost 3-1 to Chile in a practice match yesterday, Carvalho said their emphasis during training sessions had been on tightening the deep defence to cut down the number of penalty corners being conceded. Veteran full-back Dilip Tirkey, the former captain who is bidding to play in his fourth Olympics, will have a key role to play as he is also an option during penalty corner set-piece drills with his powerful hits. "Of course, Dilip is a key player and has been an inspirational figure. However, much will depend on our midfield play that can win or lose a match," Carvalho said. "But we have very good players in the midfield with each of them capable of scoring goals on their own besides providing support to the specialist forwards. That I feel is our strength." As regards the overall fitness of the players, the coach said each of them was in prime condition. The only concern was a stiff shoulder that prevented drag-flick specialist Diwakar Ram from light training last evening. Somaya, who is the team's technical director, reckoned that the enhanced fitness level of the players would stand the team in good stead in the qualifiers and a victory would be a "huge boost" for hockey in India. "Looking at the players, I do not recall a fitter Indian team. They are a young and eager bunch, and watching them, I feel good," Somaya told PTI. "If we qualify on March 9, I think it will provide a huge boost for the game in India. Even more should we go on to win a medal in Beijing," he said. Somaya was member of the Indian hockey team that took the top spot at the 1980 Games in Moscow and went on to play in 1984 and 1988 Olympics. "That would be a huge boost for hockey in India. But first, we need to qualify and in this context, the tournament here I feel is the most important that India have played in recent years. "In the previous qualifying tournaments, we only had to get among the top four or five to qualify, but this time around, we have to win the competition outright," he said. Soon after arriving in Santiago after a 24-hour journey from Mumbai, Somaya was closeted with chief coach Joaquim Carvalho to chart out the team's strategy. The two have been team-mates as midfielders and close friends who have a healthy respect for each other's hockey knowledge. Somaya said the rolling substitution and a scientific approach to training had made the game faster while the accent on weight training and gym work has added power and strength to the players' repertoire. "That explains the fast pace of today's hockey. The teams are able to sustain the pace because of rolling substitutions as it means you have fresh legs on the field. Add to that the training regime and it gives a perspective to modern hockey. These areas will be the key for success," he said. Reflecting on his playing days, Somaya said "there was a cap on number of substitutions. Our fitness levels too was not as high. So, it was difficult to last all of 70 minutes." He said in their time players would practice hard to get used to the then newly-introduced astro-turf which increased the wear and tear of their body. "The major problem then was that we were so eager to get used to astro-turf (introduced at the 1976 Montreal Olympics), that we put in too much practice on that surface leading to hastening the wear and tear of our bodies. And by the time we realised our folly it was much too late," he said. Somaya, who is a senior officer with Bharat Petroleum, said he found it difficult to make much time for hockey but now that he was here he would fully contribute to the team's success. "For the first time in 10 years, I put on the India jersey and frankly, it felt great. Joaquim was insistent that I should be part of his support staff and I couldn't turn it down though it meant juggling time away from work. Also, given the importance of this tournament, I thought I would contribute my mite to ensure that we qualify," he said. 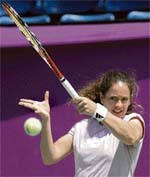 Somaya and Carvalho were also part of the 1984 Los Angeles Olympics team that the discerning reckon was the finest from India in the past 30 years. India were off to a flying start as Soumyadeep Roy downed Nosiru Kazeem 12-10, 9-11, 11-9, 11-9 in the first match. Achanta Sharath Kamal extended the lead, beating Monday Meotohun 12-10, 14-12, 11-9 in straight sets. Amalraj Anthony, who featured in the championships for the first time, sealed the issue for India as he pipped Hakeem Hassan 11-5, 6-11, 14-12, 8-11, 11-8 in a hard fought encounter. Starting out the second half of the category-21 event with a half point lead, Anand extended his lead to a full point with a finely crafted victory on another bloody day in the eight-player double round-robin tournament. The 17-year-old Magnus Carlsen was brilliance personified as he cruised past former world championship challenger Vassily Ivanchuk of Ukraine and jumped in to joint second position along with Levon Aronian of Armenia who defeated Veselin Topalov of Bulgaria in a technical masterpiece. The other game of the day between Teimour Radjabov of Azerbiajan and Peter Leko of Hungary ended in a draw. With six rounds still to come Anand, on 5.5 points, is followed by Carlsen and Aronian a full point behind. Topalov and Shirov are now joint fourth in the standings with 4 points each and Teimour Radjabov stands sole sixth on 3.5 points.